WSRMacros tool* - See note below to configure Security and Signing Certificate. If you correctly installed WSRMacros, the WSRMacro tool starts automatically the next time you start the WSRToolkit. You will know it is started when you see this icon in the lower right Taskbar. Right Click this icon. Click Security. Set Security Level to Low. Don't worry about this as you are creating the macros and they should be safe. Next, Right Click the icon again, Security and Create Signing Certificate. When you create a macro, you will sign it with this certificate. Although these programs say for Vista, they are good for all subsequent versions of Windows as well. If you have questions concerning your need for this software, use the Contact Us button to ask before you purchase. Be advised, you should have moderate computer skills to install the program and download the 2 tools mentioned above. Once the three programs are installed, the WSRToolkit itself is logical and easy to use. If you wish to transcribe a .wav file you must read the section in red (scroll down the page) on Transcripion. Transcription from a .wav file will not work for multiple voices, only an individual trained on WSR and speaking as if to the computer enunciating clearly and dictating punctuation. When purchasing you will need to agree to the terms of the sale by checking a checkbox. Be advised, if your PayPal email address is different from the email address you use to order, the email notification with license/activation key and download instructions will be sent to the PayPal email address. In this instance, after completing the order, simply use the Contact Us link at the top of a web page to notify us to send the key and download instructions to the other email address. This usually occurs quickly but may take up to 48 hours. The WSRToolkit Version 3 works in Vista, Windows 7, 8 and 10. WSRToolkit V3 works in conjunction with Windows™ Speech Recognition (WSR), the free speech recognition built into Windows operating systems. Until the development of the WSRToolkit, WSR lacked many features taken for granted by users of Dragon NaturallySpeaking. 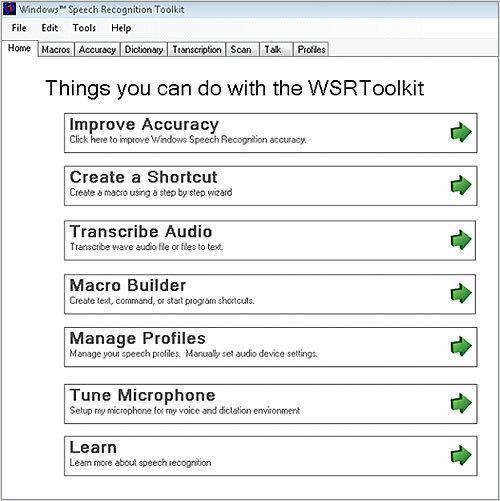 WSRToolkit adds the features you expect your speech recognition software to have! Stop Transcription button added to Transcription from a digital .WAV file. Before ordering the WSRToolkit, you must read below in red text how the Transcription feature works. Macro Wizard guides you step by step to create a command, navigation or text macro. Manage User Profiles allows easy access to create, backup and manage one or more user profile. Tune Microphone - created because Windows Audio system poorly handles microphone input. You set a custom Volume Level and SNR (signal to noise ratio). Adjust until the microphone volume meter shows only 1 or 2 bars at the bottom. Must restart WSR for adjustments to take and you should not use WSR's Setup my microphone thereafter. Talk feature uses Windows Text to Speech to read back a document and to stop reading at any point. Context Sensitive Help - each page and feature has easy to understand help at your fingertips. Just click the Help button. Simulate Recognition is found as an action at the end of the Create a Shortcut Wizard. This allow you to string multiple commands such as Select Paragraph + Delete into a single command. Text Macros- easily create boilerplate macros that inserts blocks of text at a single voice command. For example, at the end of my letters I say, "Sign off," and my name, company name and web site are inserted. Command Macrosallow you create step by step macros that utilize keyboard combinations. For example, I say, "Import Orders" and the macro executes Alt+f for the file menu, then "U" for Utilities, then "I" for Import etc. Transcription reads .WAV files from a digital recorder and transcribes it to text. This is meant to be used by the person who has a personal user profile and dictates as they would in front of the computer using good enunciation and punctuation. It is not meant to transcribe multiple voices from a meeting. The digital recording file must be a high quality .WAV file (not compressed). You can test before ordering by playing your .WAV file in Windows Media Player. If it does not play in Windows Media Player, it will not transcribe to text. Accuracy (formerly Train From Text) allows you to select the text of your choosing and read it to the system. This trains the 'Acoustic Model' of your speech profile to make it more likely your words will appear according to your voice and style of pronunciation. Dictionary (formerly Add To Dictionary)provides an easy way to add words or phrases to your personal speech dictionary. Use the Manage Words function to prevent a word from being recognized or to edit a word or phrase you've added. Scan (formerly Add From File) parses personal MS-Word and Text documents of your choosing to increase dictation accuracy. It finds the context within which you use words and improves the likelihood these words will appear accurately. Professionals like Physicians and Lawyers should use this feature to add their reports etc.